I've given up on summer coming back again so I'm just going to pretend from here on in. 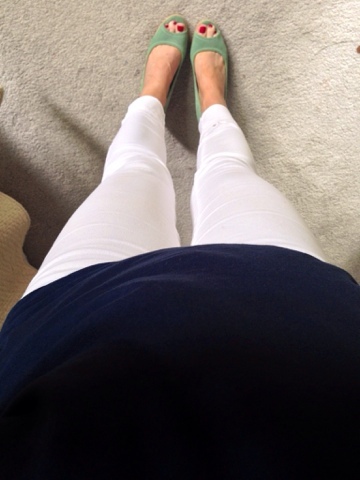 Starting with getting my white jeans out on the nicest day this week..let's not talk about the other 6! I got these jeans in H&M a few years back and whatever material they are, they have kept their colour really well. I seem to remember they were only £14.99. 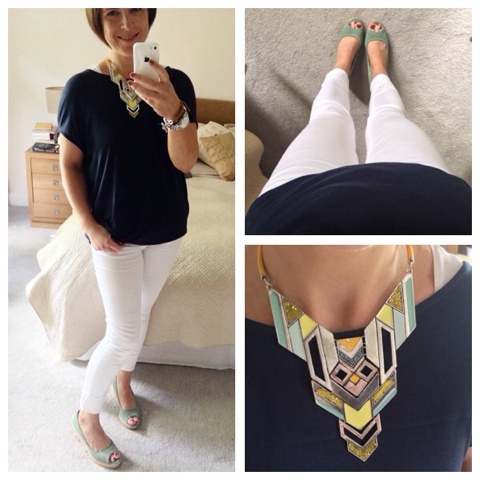 I kept the rest of the outfit simple, wearing my F&F at Tesco navy top - best buy for sure. It washes and dries like a dream and is so easy to wear. 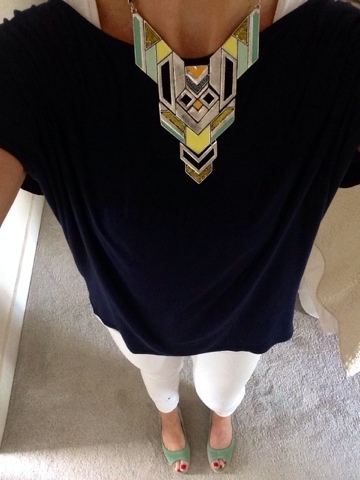 I can't find the exact top online but the one I've linked to above is very similar. Feeling the need for a bit of colour, I added in the White Stuff wedges that my sister in law gave me recently. They come up really small - hence I ended up with them. She's almost a full size smaller than me so these are just a 5...but fit my size 6 foot perfectly. I can't find these online to link to. And then I thought 'sod it - let's get the big guns out' as the green in this amazing statement necklace is closer to the green of the shoes. This one is also from my shop but it's out of stock at the moment. I love how it shows the colour of whatever top I wear through the holes in the design and I know it will work really well at choir with my yellow and black uniform. I don't have any left in the shop but can order them in my next delivery at the end of August. It retails at £15. So tell me, have you had the white jeans out yet? I'd forgotten how nice and fresh they are to wear and how they 'summer' up your look so easily without having to bare too much skin. Yes, they do get grubby after one day's wear but as long as that doesn't bother you too much, they make a nice change from denim. Do buy a good quality slightly thicker denim though and remember to check the rear view before wearing to make sure there's no VPL! Hope you're having a good weekend. Tomorrow's to be a wash-out here in Belfast so we've booked to go see 'Inside Out' - can't wait! You can't beat getting the white jeans out can you Avril. Here's hoping summer puts in another appearance soon, in the meantime enjoy the cinema. 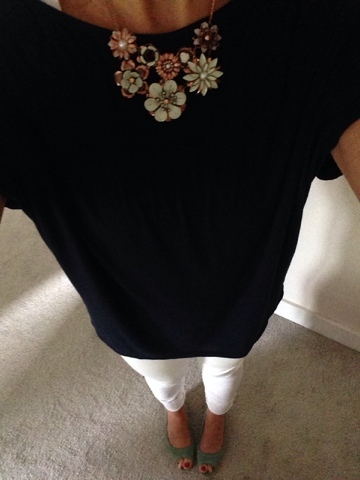 Love white jeans and navy together. 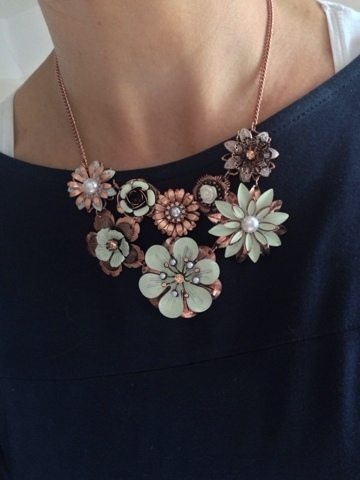 I was looking at that necklace in your shop just yesterday, Now I've seen how gorgeous it looks worn, I will definitely be ordering when they are back in stock. 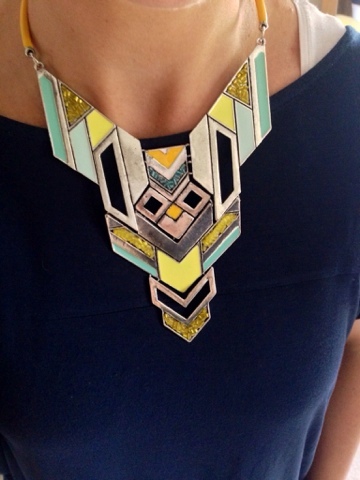 I bought the gold leaf necklace and the harlequin scarf recently and I love them.